Tired of the daily hustle and grind of the everyday life? Nothing better than some time outdoors to revitalize and get the life back in you again. After all, who doesn’t love the serenity of mother nature, right? But if there’s one downside to the great outdoors, it’s getting a good night’s sleep. Your tent can be set on wet and/or rocky terrain, and no, your yoga mats won’t help you either because yoga mats do not make good sleeping pads. But where yoga mats fail, the best camping air mattress will succeed. We want to help make your air mattress buying decision as easy as possible so we've tested and reviewed the top 5 models we can find, down below. We found the best camping air mattresses for couples and families as determined by our tests and they have been reviewed and compared on the basis of important features like inflation and deflation time, comfort level, durability, and price. The last thing you’d want is to miss out on the bone fire dance, the singing etc. while you’re too busy inflating the air mattress, right? With the proprietary smart pump of this mattress, you can have it done in under 4 minutes. Also, the auto-shut of feature makes it a set it, forget it pumping system. And since it's 20% less noisy than its competitors, nothing distracts your family or friends. Lastly, with the pressure detector, it guarantees a sound sleep even on the rockiest of terrains by maintaining optimum air pressure levels. 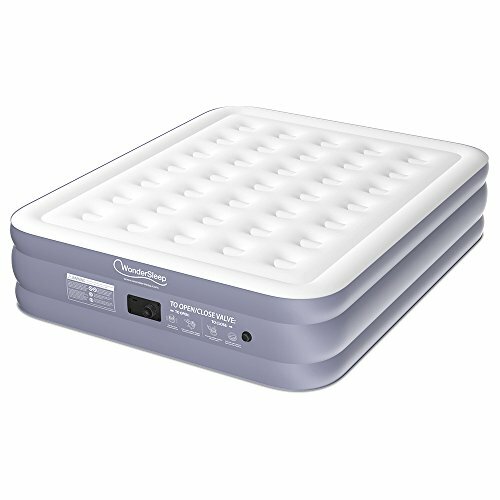 All camping air mattresses lay emphasis on comfort but CloudNine stands head and shoulders above the rest. Yes, automatic pressure detection helps, but the advanced technology of this mattress called ComfortCoil and the I-Beams Internal Coil maintains optimum firmness for a blissful sleep. Furthermore, the SureGrip bottom layers keep the bed in place as you twist and turn while the raised edges keep you from falling off. Lastly, the inflated dimensions of the mattress are 78" x 58" x 19", which means it can easily fit a family of 3 to 4 people on it. From water to punctures, the CloudNine is resistant to a lot of stress because it is made using PVC. Adding to the comfort and durability is the double layer coating which also makes it a heavy contender as it allows the mattress to hold up to 600 lbs. Since this mattress is on the thicker side, it’s a little heavier, but the specialized carry bag makes carrying the mattress easy peasy (lemon squeezy). The CloudNine is money well spent and our top choice for the best camping air mattress. After all, who doesn’t love a good night’s sleep? If you’re looking for a cheaper alternative to the SoundAsleep mattress, the Dream Series fits the bill. It carries over most of the positives from it's predecessor when it comes to comfort and durability, but keep in mind that the SoundAsleep is more expensive for a reason. One of the drawbacks of this mattress is the 1-click internal pump. 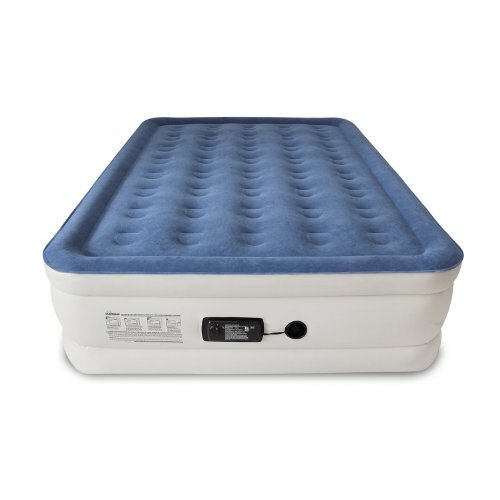 Yes, it helps with faster inflation/deflation, but is also more likely to leak, or break down and then the mattress will need repair or replacement, which could make this camping air mattress more expensive in the long term because of maintenance. Nobody wants to spend a bulk of their time in the outdoors inflating and deflating their airbed, and that’s exactly what the 4D battery operated pump of this mattress ensures that it inflates under 5 minutes. Plus the factory tested AirTight feature keeps the valves locked and the bed loaded with air so there’s no risk of waking up to a deflated bed. No leakage means you can keep the optimum air pressure which means consistent firmness levels all night for a comfortable sleep. 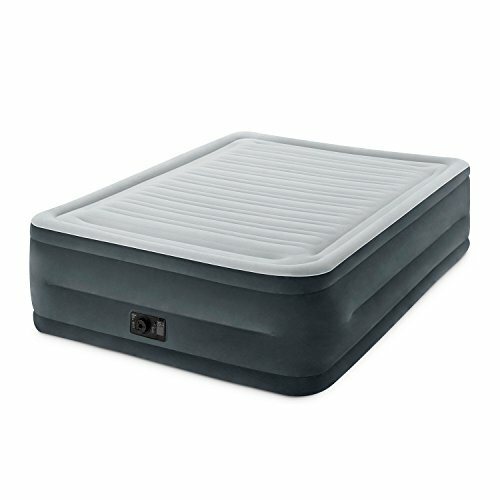 This Coleman camping air mattress replicates a conventional bed mainly because of the steel frame. The frame provides a heightened airbed which ensures no creepy crawlies cozy up next to you at night. It also means you’ll have plenty of space below your bed to store essentials like your bags, shoes etc. The inflated dimensions of the mattress are 78" x 58" x 19", perfect for a couple out with their kiddos. Lastly, there are cup holders on the side so can wake up to your favorite coffee .thermos or water bottle right next to you. The steel build of the frame and coil construction allows this camping air mattress to hold up to 600 lbs, making it a highly durable choice. Adding to the comfort and durability is the ComfortStrong coil construction which reduces bulging, in turn, lowering risk of punctures and providing utmost firmness. The steel frame and thick construction increases the weight and thus it's not suitable for backpacking but is perfect for glamping. In case of any trouble with the 4D pump, repair may need time but with the right care that’s highly unlikely, making this one of the best camping air mattresses we tested. There’s a reason the Intext Comfort Plus air mattress is an Amazon best seller for camping air mattresses and no that’s not just because of its low price. With the built in electric pump, inflation and deflation can be done within 5-6 minutes, but make sure you’ve got the dial at the right position for best results. What if you got no electricity? The mattress can be inflated manually as well, using an external pump, but make sure you save some of your stamina when you're out hiking. Like saving room for dessert. Only the dessert is blowing up the mattress. This bed is one of the largest on the list with dimensions of 60 x 22 x 80 inches, which means it has the benefits of height like the Coleman but without the added weight of the steel frame. Furthermore, the groveled sites help keep the bed sheet in place while the reinforced bottom keeps the bed from sliding away. Though big, it’s one of the lightest beds on the list and can easily be folded and carried using a duffel bag. The FiberTech technology of the mattress means that it’s made up of thousands of strong polyester fibers, making it durable while providing comfort and stability by dividing your bodyweight evenly. This prevents the mattress from bulging, which as you probably know, adds to the shelf life of a mattress. This camping air mattress is also waterproof and suited for stormy camping trips. There have been issues reported regarding loss of air pressure overnight and thus we can't promise that firmness levels will stay consistent. 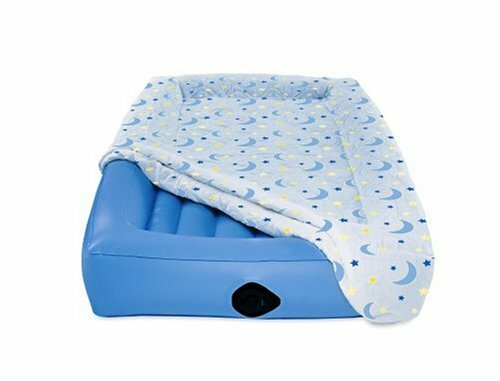 The built-in electric pump does a good job when you need it but the pump doesn't seem like it's built to last, and this mattress may need maintenance for longevity. Also, while it’s large size is mostly good news, you’ll need a larger tent to fit it in. Lastly, it needs electricity to inflate. Manual inflation is going to be both time consuming and energy draining. It’s got a few cons, but for a mattress that costs less than $100, it’s still a bargain. After a long and tiring hike, you probably want to drop dead on your bed right? Luckily with the internal rotary pump this bed gets inflated and deflated in under 4 minutes. And in case you’ve got no power around it can be inflated using the manual external air valve, but it will require extra effort and time on your part. The DreamCoil Tech consists of 35 strong coils that provide adequate cushioning and firmness to support the spine, ensuring a good night's sleep. Which is what you're looking for in a camping air mattress. With the groveled sides, your sheet won’t slip off during the night. And the reinforced bottom keep the bed's position intact. The 20 lbs of weight and the free carry pack means you won't feel the burden of carrying the bag, even during a longer hike. While making sleeping comfortable, the 35 coils also provide durability, so this mattress is going last you for many hikes. The DreamCoil Tech in tandem with the multi-layer build makes it puncture resistant while the waterproof flocked means it can be used even in wet conditions. There have been complaints of the mattress losing air after some uses but with the quick inflation that can be taken care of. The material takes time to stretch out and thus may snag but only for the first couple of uses. 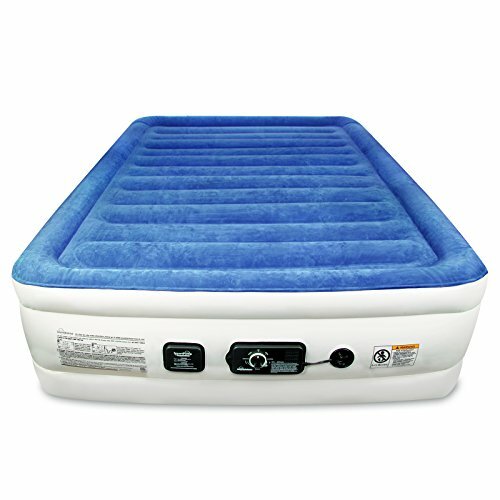 For the quality and the price, this camping air mattress is easily in the top 5 available on Amazon. If you’re planning a weekend hike with your family, we’re sure the safety of the kiddo is of utmost priority, that's why we've chosen the AeroBed Air Mattress in the top 5 camping air mattresses. The AC pump means the mattress inflates/deflates in 15 seconds, yes you heard that right, 15 seconds. The dimensions 50 x 25-inch provide an adequate surface for kids of age 4 and above. With the raised edges of the risk of falling off the bed is 0 so no cries going to spoil the fun of a late night bonfire. PVC is often berated as it is harmful to the health but with the mattress pad on top, your child’s in safe hands. The mattress weighs a mere 1-2 pounds and can be easily folded making carrying it hassle-free. The industrial grade PVC build makes the mattress water resistant and can be cleaned off with a wet/dry cloth. The mattress pad can be machine washed if need be. The PVC build combined with the electronically welded seams prevents punctures and thus can take all the jumping about without trouble. The pump needs an electric outlet and cannot be externally inflated. Also, any weight above 250-300 lbs can result in leaks and punctures. Not the most perfect camping air mattress, but great nonetheless. For a mattress that costs less than the other ones, it’s a good buy and is especially designed with kids in mind. It's perfect for short trips, glamping, and hike-in camping.